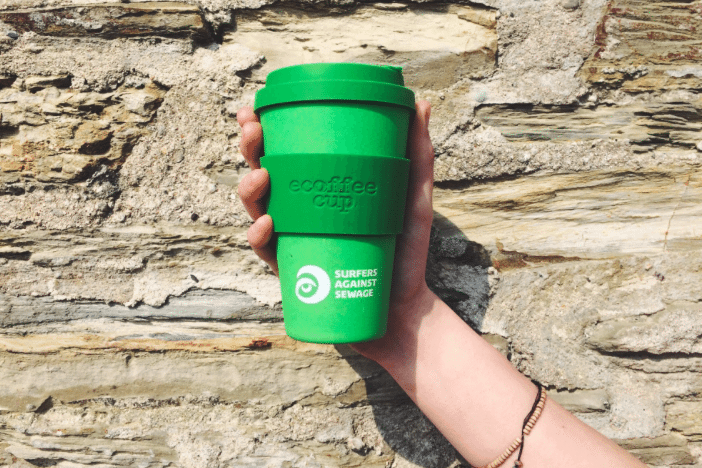 The Best Sustainable Coffee Cup for Your Coffee To Go! The war on disposable cups used in the food industry should be a higher priority than it actually is. 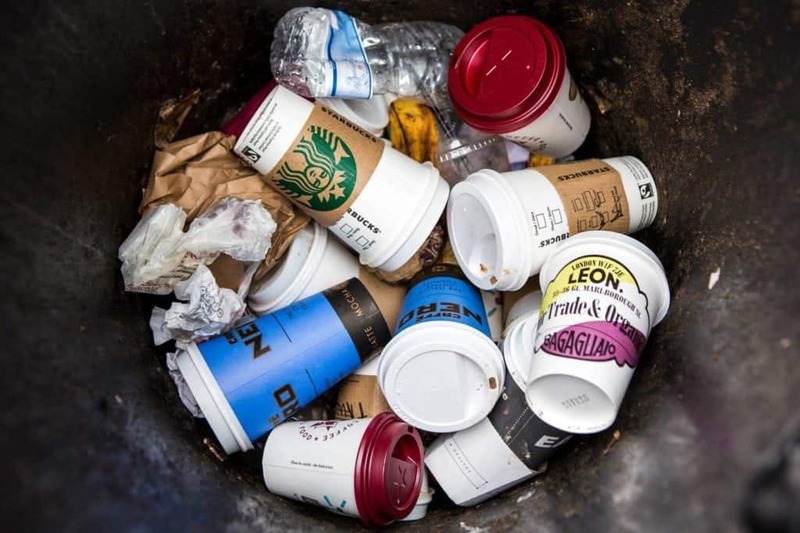 The convenience factor of grabbing your coffee or any other beverage on the go and not taking care of the waste that is left behind causes massive piles of rubbish ending up in the world’s landfill. The majority of people do not know if their cup is recyclable or biodegradable, hence it ends up in a general waste. Karo took on the task of filtering through numerous sustainable options of drinking coffee outside a cafe or your kitchen and hopes it will give you an overview of the cups that could become yours. Potentially, the following cups might be your way of chipping in, to bring on a more sustainable future and a protection of our environment. 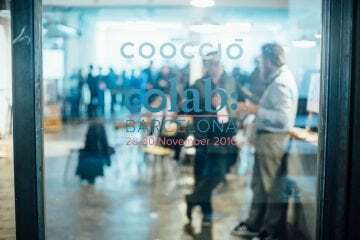 Discover her list of reusables! I have been using a variety of takeaway cups for years now. As many people, I had my Keep Cup at ready for the morning commutes to work. 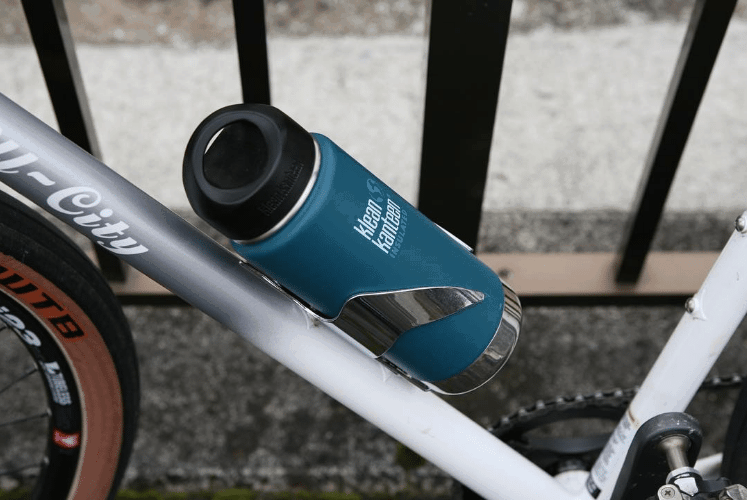 Moving from bus to a bike transport I opted for a sealable Klean Kanteen which I discovered thanks to Barista Guild of Europe. Now I got curious about the options of takeaway, travel, on-the-go cups and mugs that would make people think of how they drink coffee when they are out and about. The following is a list of some that I got recommended, and others that I love and even newcomers that were recently released. Share the list with someone who could be a bit better with the environment and share your favourite one with us! Reusable takeaway cups are an easy solution for someone who just wants to hold their cup constantly in their hand while running into the office, commuting to work or just walking around the park. 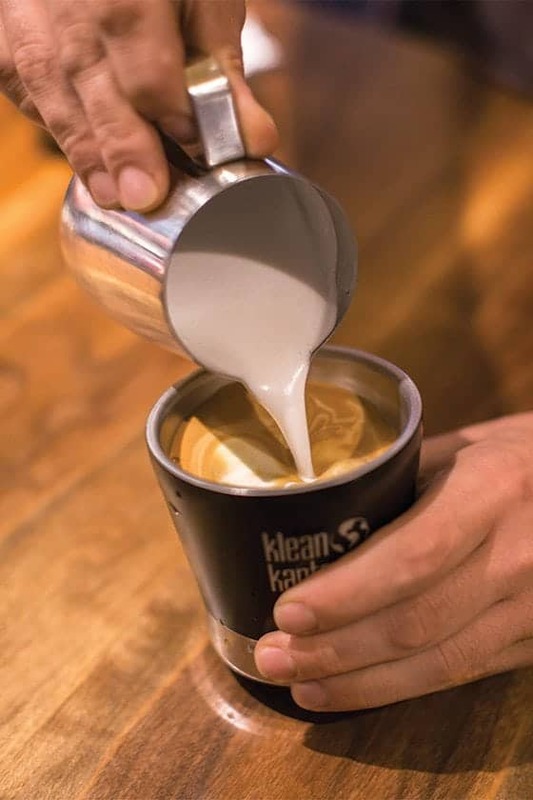 One of the latest products of Klean Kanteen is a handy mug that has got a shape of a regular cup, so it fits a brew or a cappuccino perfectly, but it is its clip-on lid that is the splash-proof advantage to any other reusable coffee-to-go solution. Double-wall vacuum insulation and the size of 8 oz (240 ml) makes this tumbler the perfect cup for a morning coffee on the go. 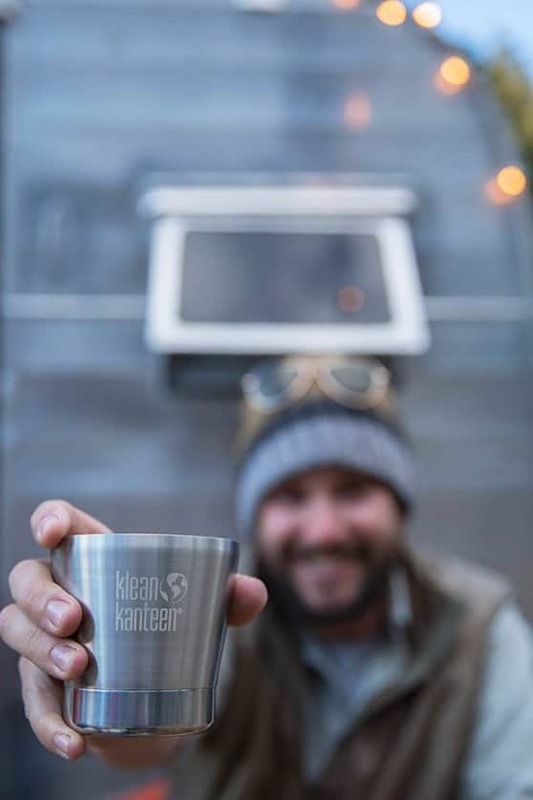 It keeps hot for up to two hours, but since it is suited for cold drinks as well, we invite you to incorporate it into your travels and sip on a tea from it at the camp site or have a beer in it at a festival. You can get it in a bigger version as well and it comes with the lid that is splash-free. Nobody likes to drive their car with splashes of milk around, or dance at a festival with a beer above their heads—or the rest of it! Bodum is a brand of kitchenware who is probably the most famous for their glass double walled cups. It is great that they are invested in the sustainable travel cups as well. They have options for those who are fine with one cup, but also the heavy drinkers. 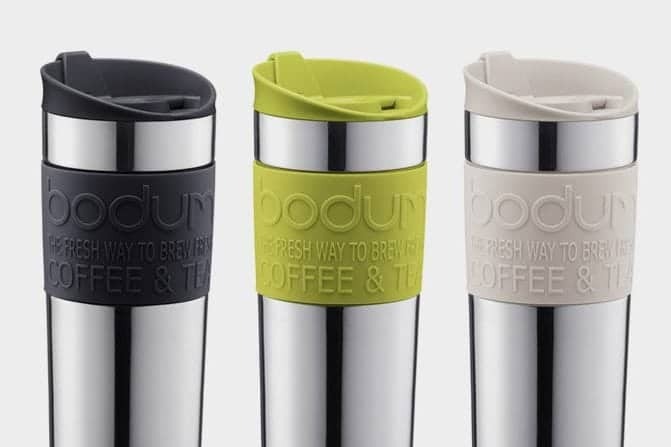 Here we feature the Bodum Travel mug. It is comfortable to carry around and decently sized. We only miss the security feature of no leakage. But that is the case of the take-away paper cups as well! Give this one a go then. 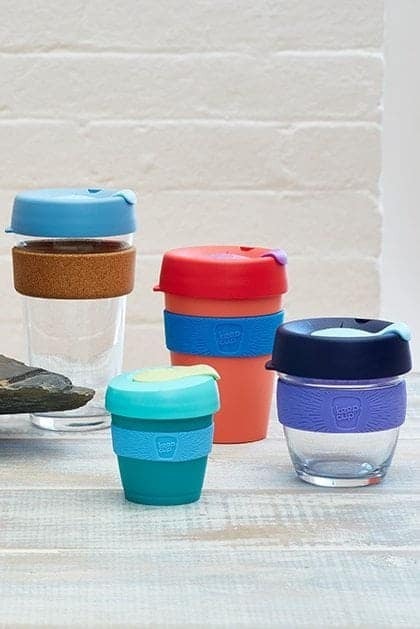 Keep Cup, the Australian company that has built a reputation for itself for producing one of the first signature sustainable takeaway cups, has a large offering of colours and sizes. 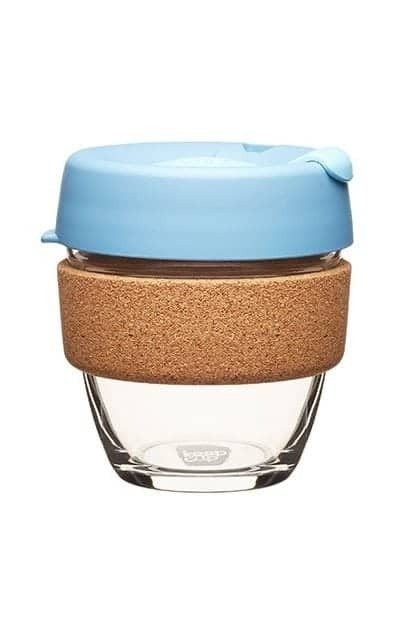 Since my preference for a coffee-to-go is usually a filter one, I would always opt for the glass Keep Cup with a cork handle. Glass does not disturb the delicate aromas of your brew as much as the plastic sometimes does, although it is probably more precious to carry around. I find it the most elegant way of taking your pour-over coffee on the go since it almost looks like a cafe serving. And it will remain warm for quite a long time, too. A tip for the coffee enthusiasts, the latest colours are in the range of the coffee flavour wheel. That is definitely a nice thing to geek about! 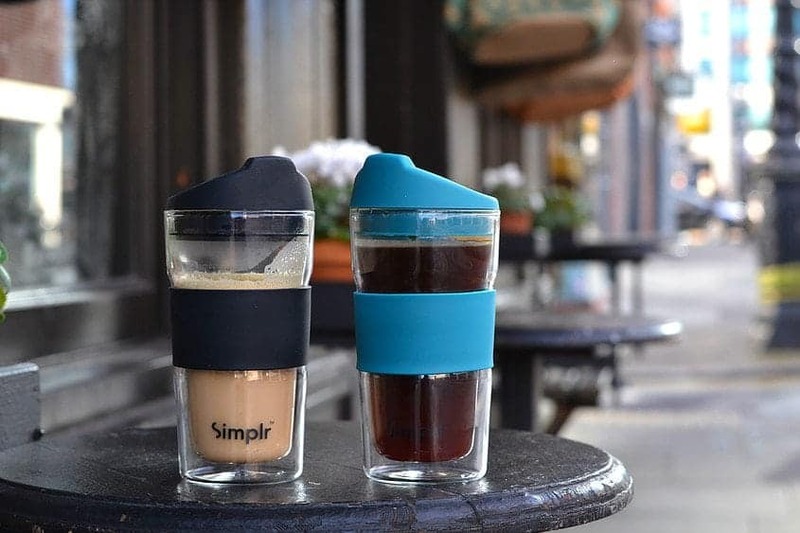 These reusable coffee cups are a similar type to Keep Cup and their glass version is the only version of this shape they produce. Similarly to other brands, the silicone lid is a clip-on one, just as with usual take away cups, and so you are not advised to put it in your bag. 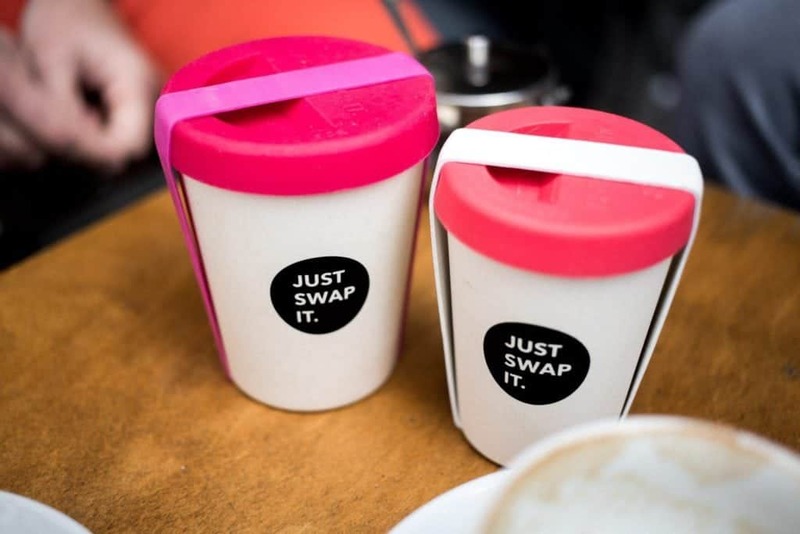 It is great there are more brands embracing the reusable cups and JOCO’s range of colours is definitely finding its customer group. Simplr has been producing double-walled insulated glass tumblers since 2016. In my eyes, Simplr embraces the popular idea of having a really large drink to go, while retaining a simple esthetics that is timeless. Are you a fan of lattes, filter coffee that will last you a two-hour walk with your dog, or have big hands? Simplr is a simple choice then. The Bamboo takeaway cup is a great compromise to a light coffee mug to go, which is also BPA-free, phthalate free and doesn’t contain petrochemical plastic. The naturally organic and naturally sterile bamboo fibre gives the cup its great advantage over other takeaways. Not only can you take the Surfers Against Sewage cup everywhere, it is light, yet resistant to water damage, you can also easily recycle it when you really do not want it anymore. The cup can be crushed into pieces and dug in your garden. What other reusable cups can you do that with? 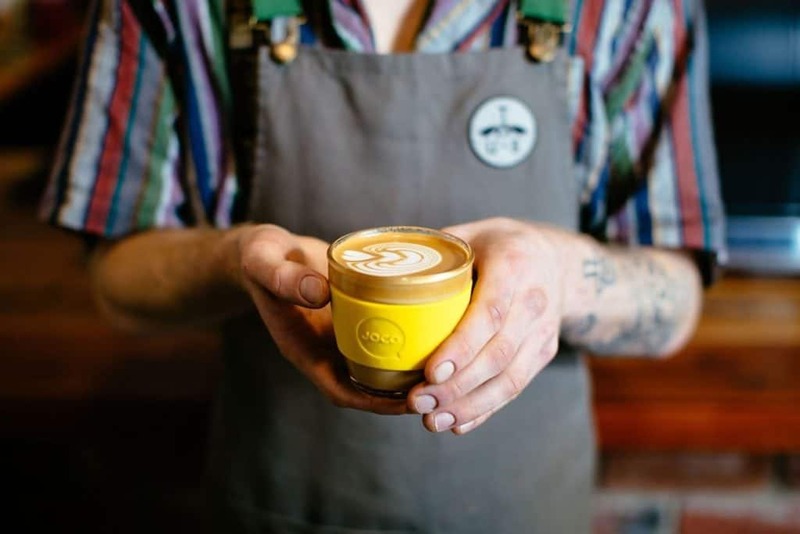 The best and the most approachable takeaway cups that won’t kill the planet must be the Berlin’s Just Swap It bamboo, resin and cornstarch cups. The cups look very similar to the traditional white paper cup and come in two sizes as well: 180 ml and 280 ml. Stack it on top of your coffee machine and merely any customer might notice the difference. Of course, unless they hold the cup in their hands. It comes with a silicone lid and the whole idea of “Swap It” is simple: Buy a cup once and keep it until it dies. Simply swap for the bamboo cup. It holds nicely in your hands and the hot drink won’t burn you! As big filter coffee fan, and an advocate of responsible treatment of our environment, I am definitely biased when it comes to preferred types of reusables. I would recommend anyone to buy a big reusable bottle for their water and have a large thermos at hand for their morning brews or teas. 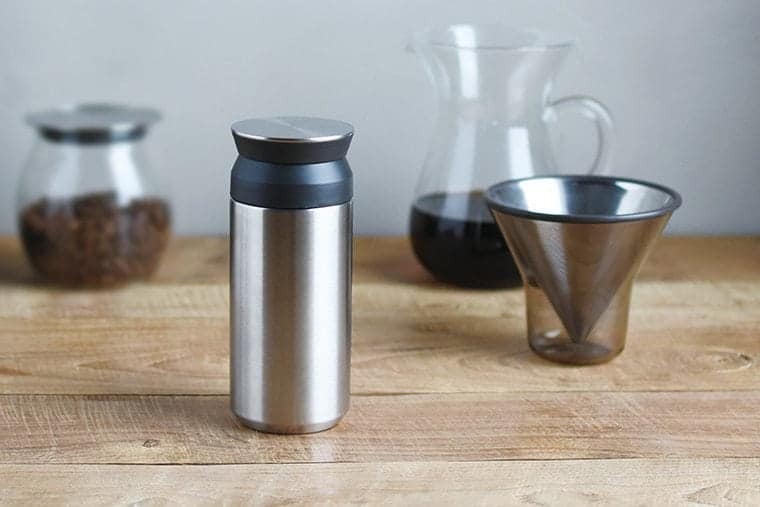 A whole filter coffee can fit in a thermos and keep you caffeinated, but the fact you can seal the thermos makes it so much more appealing to me! Have your coffee with you and keep your hands free. For active people, drivers, travellers, mothers with trolleys, tourists, kids… there is really no other option! And the choices are plentiful. The US brand has been producing high-quality, insulated and water bottles for years. Klean Kanteen were cool before anyone else. Through their simple, yet varying designs, they really make a sustainable approach to the way that we live simple. With the option of choosing different sizes, lids, colours and materials, you are really not left with any other choice but to buy one bottle for yourself. There are also options for kids. I have used their 16 oz (473 ml) bottle for a few years now, and they are still as new in terms of functioning. The material does not pick up any flavours or odours and it keeps the drink hot as new. It is one of my favourite products that I use every time I travel. Try it out! 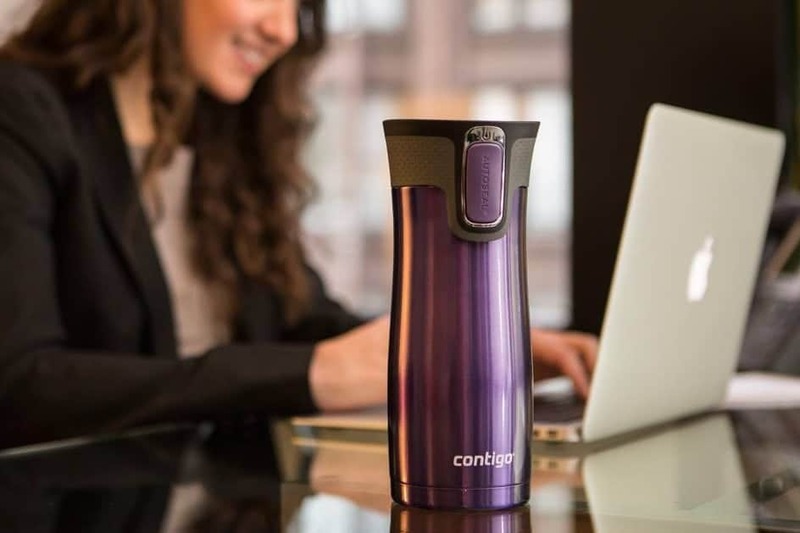 Contigo is a sport and activities brand that supplies with thermos bottles anyone in the need of a hot/cold beverage while out and about, sporting, playing or travelling. We like the range of products that Contigo offers since there is a growing number of people interested in brewing delicious coffee out of the comfort zone of their kitchen. This brand allows them to prepare their delicious coffee and take it with them to no matter where they are headed. For anyone with an active lifestyle and a job on the road, this cup is the perfect option. Imagine having a brew on the mountain hill, above the clouds or while roller-skating around the park with a trolley. Yep, this cup can take it, and it is spill-proof! Kinto is a Japanese brand of products for coffee and tea brewing and serving, which brings a modern touch to any household. Recently, they have also launched their version of a modern and minimalistic twist on reusable flasks, suitable for hot and cold drinks. It is to be the perfect combination of functionality and aesthetics. We are sort of in love with Kinto Tumbler that proves that reusable cups do not have to be ‘too outdoors’ for your outfit. These are the perfect fit for anyone with the passion for responsible fashion and consumption. 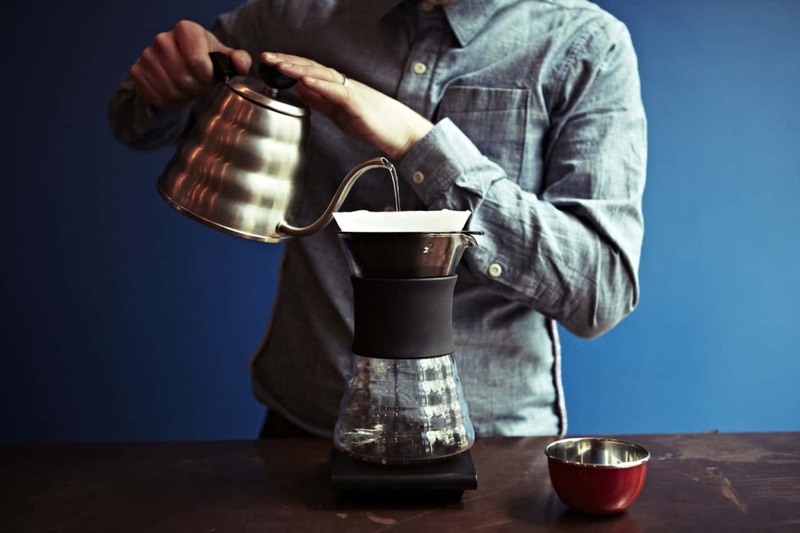 Kinto has caught my eye with their pour over kettle that is just an embodiment of elegance, and now the Tumbler is what I feel would be a great investment of my money. Stainless steel, double walled, vacuum insulated. Its inner structure even catches ice cubes in your drink, so that they do not fall out while drinking. The only disadvantage is it does not come in any other but 350 ml version. I would go for 500 ml or a litre one for my water too. Have you chosen yours? Tell us about it!